Since I wasn't in town when everything went down, I don't have many photos of the installation, but my husband was nice enough to capture a few during the process. Below is what the kitchen looked like when all of the countertops and sink were removed. 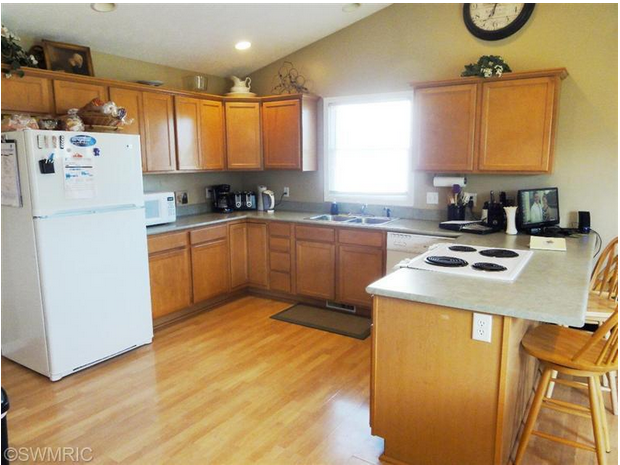 He also had to remove the dishwasher from the corner so that they could install the countertops in the corner. 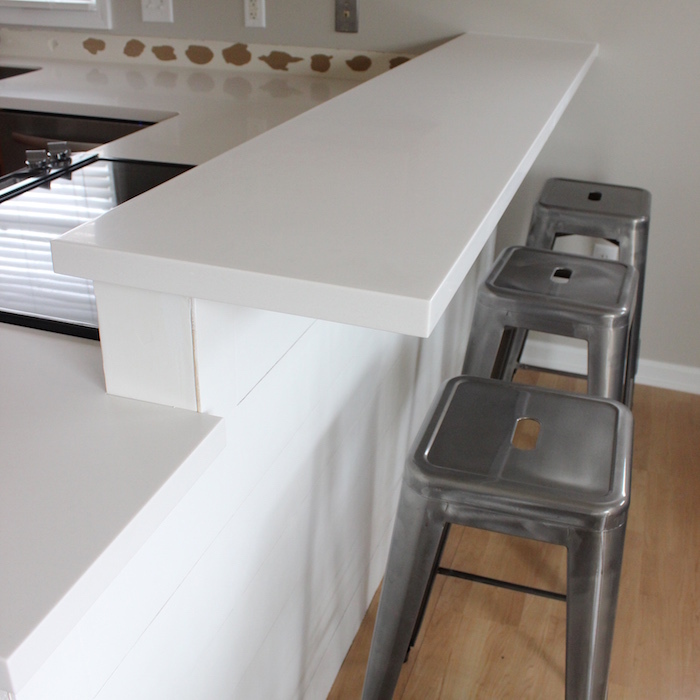 The countertops that we had installed was the LG HI-MACS solid surface in Lunar Sand (bottom left in image below). 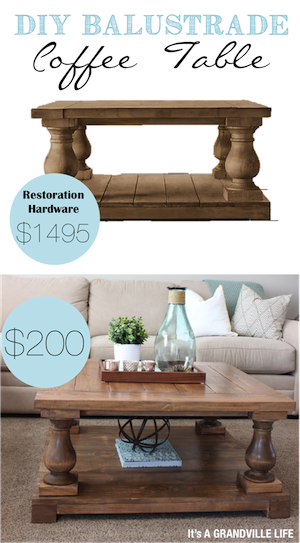 The reason we went with this option was pretty simple, we could afford it and it made the most financial sense to us . In my dream kitchen in a long term home, I would use a granite or quartz that wasn't as plain looking and that more resembled marble, but this isn't our long term home so it didn't make sense to invest a whole lot of $$$ in countertops that we would never get back when selling our house. It's important to us that we don't put more money into the house than we can get out of it, so we always base our home project decisions on this principle. We considered using laminate countertops because it was the most affordable option, but as I mentioned in my kitchen plans blogpost, I just couldn't find any laminate options that I liked so the next price level was solid surface. What I love about solid surface is that it doesn't have the price tag of granite or quartz but feels smooth like it and doesn't have that laminate feeling. 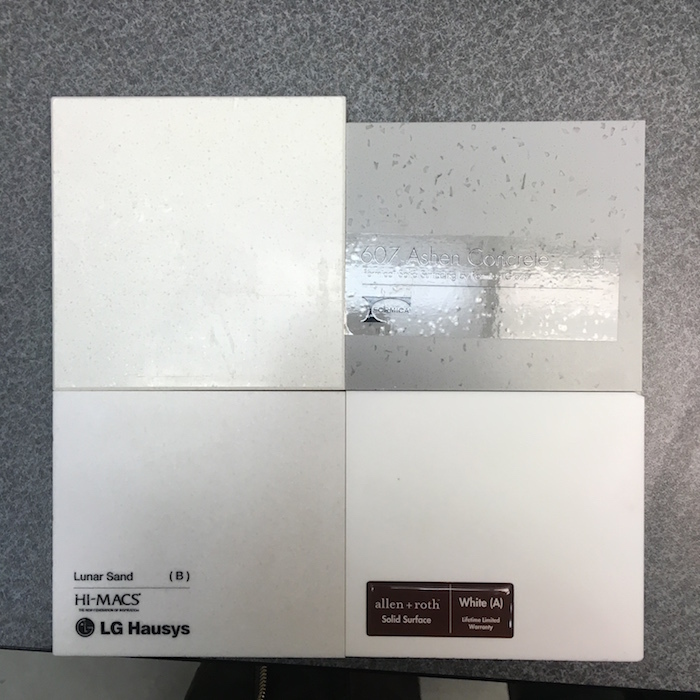 The down side of it though is that it is not heat resistant,and it can scratch, hence why we went with a light colored option because scratches don't show as much on light solid surface. It may not be my all time favorite countertop, but it's a 10000X better than what we had which makes me a me a very happy and content gal. Enough about the counter tops we chose, lets see it in action! Here is an image while it was being installed. When I got this image from my husband while I was in OR I was jumping for joy. I was especially excited about the bar top area, that as you can see had to be clamped while it set. Once I got home I snapped a few photos of the finished product! I am so happy with how the breakfast bar area turned out! If you recall, we built this half wall because our oven had to be pushed back a few inches so that the dishwasher could open, and I didn't like how future kids (or adults) could potentially touch the burners on the range if they were sitting at the barstools in the original kitchen. Now with the new breakfast bar, I don't have to worry about it. Plus I think it makes it look more custom, which I love. 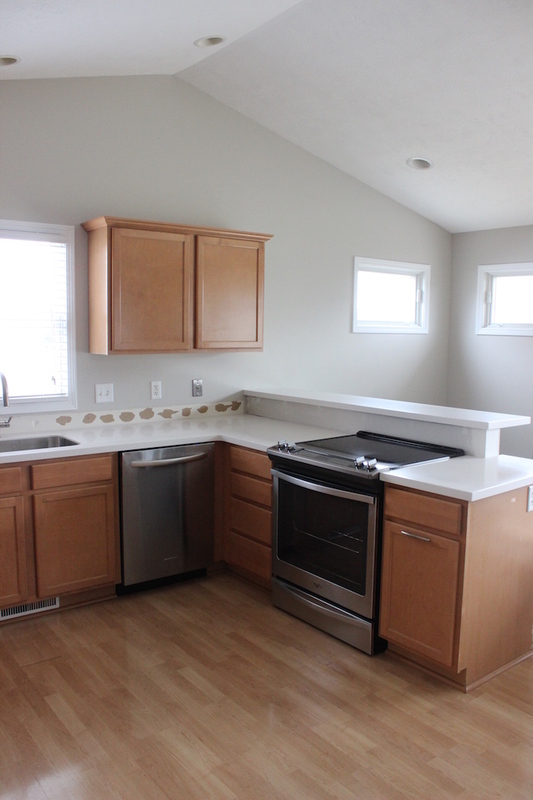 In some of the images, it looks like the countertops are white, but as you can see in the image below , the countertops are actually really light gray instead of white like the shiplap wall. Speaking of shiplap, I can't believe that I now have it in my house! Thanks to JoJo Gaines shiplap is all the rage right now, and I too have fallen in love with this look. 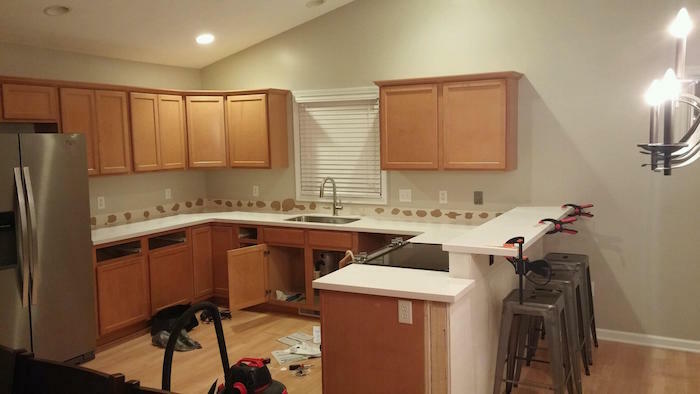 I really wanted to tackle this project on the breakfast bar half wall, but I was out of town and it needed to be done before the countertops came, so Paul did it himself and it turned out amazing! 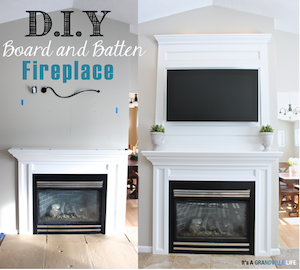 I wanted the more traditional shiplap look, so I had him use 1 x 6 for the half wall. You could also use 1 x 8 if you wanted the panels to be more thick. If you follow me on Instagram, I shared how I will be doing a trial on painting the backside of some of our cabinets with the hope of being able to paint all of the cabinets, so Paul used the paint that I bought for the cabinets on this half wall so that we could see the paint color in big scale. It's the Benjamin Moore Advanced paint in Simply White, otherwise known as the 2016 Benjamin Moore color of the year. After seeing the color in big scale I can see why it's so popular. It's not a stark white, but it's bright enough that it doesn't look creamy (better seen on the last photo). The wall still needs one more coat of paint, but I love love LOVE how it turned out! It gives so much character to a rather boring space! So what do you think of the first stage of the kitchen renovation so far? I LOVE the changes so far!! Weirdly enough, one thing I'm most excited about is the new sink which I will be blogging about soon, because I think it deserves it. I never knew I could be so excited about a sink. We will begin stage 2 very soon which will include installing the hardware and I will be doing my painted cabinet trial before I leave for my cruise in late March (fingers crossed it goes well) so stay tuned for more updates soon! Absolutely gorgeous Megan! Absolutely gorgeous! Okay...that's it! I need an island makeover! 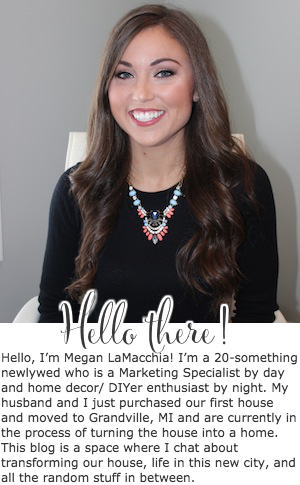 This is fantastic, Megan! Granite is likewise a warmth safe material that implies you can put hot dish and utensils at your kitchen ledge's surface itself, there is no compelling reason to search for some other surface.